Roses and daisies last well in a floral tribute. 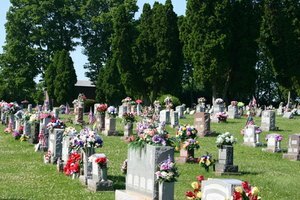 Funeral wreaths and floral tributes are treated and preserved by a florist to last longer than untreated cut flowers. Florists use Oasis to keep a wreath or container arrangement in place, and the flowers hydrated. Oasis is a block of rigid cellular foam capable of retaining 40 times its weight in water. Freshness, and variety of flower determine how long a wreath will last so choose hardy seasonal blooms for long-lasting funeral flower arrangements. Carnations are always in season and easy to source. Opt for seasonal varieties such as sunflowers in the summer or roses and daisies in the spring. 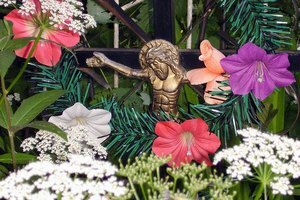 Funeral flowers spend much of their time outdoors, so choose hardy carnations or chrysanthemums if the wreath is to remain outside in adverse weather conditions. Carnations are readily available all year round and can last up to 10 days in optimum conditions. Seasonal flowers arrive at the florist freshly picked from the supplier. Out-of-season blooms are often imported from another country and have a shorter shelf life because they spend more time in transit between the grower and florist's shop. White lilies are a traditional choice for wreaths. Exotics provide a stunning floral display, but they are short-lived. Locally sourced and less-traveled blooms look fresher and last longer in wreaths. Florists can source most varieties of flowers close to home when they are in season so there should be no problem finding locally produced floral displays. Lilies, alstroemeria and orchids are known for their longevity as cut flowers, and make versatile additions to wreaths or floral tributes. Ask your florist to create an arrangement in a basket or container. 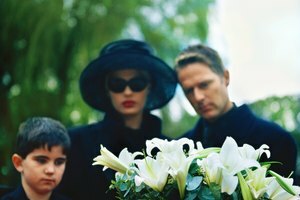 A colorful basket of lilies or carnations is a suitable floral tribute if you would like the family to take the flowers home after a funeral. Displays in baskets or similar containers are designed to last longer than tied bouquets. Florists select the flowers for their longevity and mount them in oasis foam. If you top-up moisture levels in the foam, a flower basket of carnations or lilies will last for 7 to 10 days. Anthuriums can remain fresh for up to 6 weeks. Dried flower wreaths are a rustic alternative to traditional funeral flowers. Dried or partially preserved flowers and grasses are an alternative to traditional funeral wreaths. The addition of fabric swags, rattan bases or wicker baskets add a rustic element to the display. 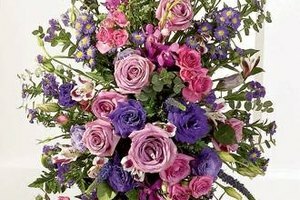 If you wish to give unusual funeral flowers that last longer than a week or two, choose an arrangement with dried statice flowers, reeds or even herbs. Dried wreaths are usually suitable for outdoor use, but check with your florist if this is important to you. Burgess, Alex. "Funeral Flowers That Will Last." 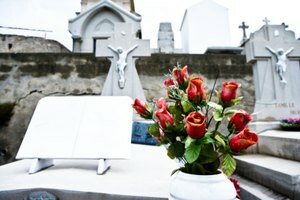 Synonym, https://classroom.synonym.com/funeral-flowers-that-will-last-12082534.html. 29 September 2017.